WIN! Pamper Hamper Worth €100 From Inecto Pure Coconut! HUZZAH! Hands up who wants to start off the New Year with gorgeously glossy hair and healthy skin? Yup, thought so, and with this prize from Inecto Pure Coconut, it's well within your grasp. I have one gigonormous hamper packed full of hair and skin care products - all to the value of €100! Coconut Oil has a high moisture-retention capacity – which is the fancy term for saying it keeps all of the good stuff in. It's been used in effective skincare and hair care for centuries, to assist in the treatment of skin problems, stress-reducing massage and health promoting diets. Inecto's range of 100% pure coconut oil skincare products are made to hydrate all skin types, while the unique formula helps to hydrate and revitalise hair - and all at an extremely attractive price point (between €3 and €5!). The range is available in pharmacies and department stores nationwide - check out www.inecto.co.uk for more. And to get your hands on that fabulous hamper (Ireland only this time), pop your details into the widget below! I need this in my life, especially after all the partying over Christmas and New Year! A little bit of luxury never did anybody any harm. Ah I love all things coconut! I'm such a big fan of coconut,i would love to use these products! Hadn't heard of this range before - looks great. great giveaway. Count me in . Love coconut, would love to win! i loe it.. hope to win!!! I will check out this brand Ems! Good luck to all contestants! Looks like a fab hamper and the perfect way to start the new year! This looks lovely! I'm always up for trying new products. I feel like I totally need to change up my routine, I'd love to try these products! Would be a fab start to the New Year with this lovely lot! LOVE anything involving coconut oil! I LOVE coconut in all forms, desicated, milk, and in gorgeous products like Inecto! another fab prize.. one of these days I might even win one! 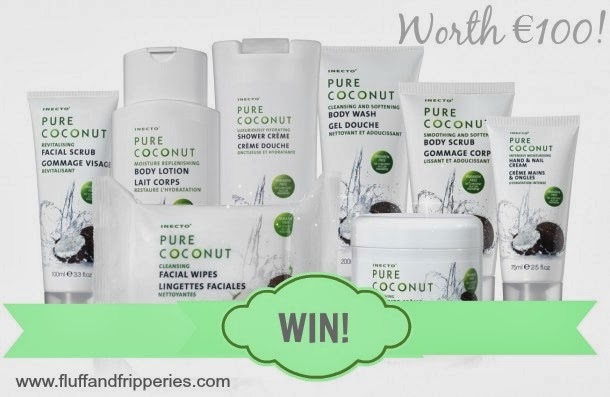 Great prize, I love coconut! I am Obsessed with anything coconut!